I like the Miu Mius! I love the forever 21 wedge. OHH... I would spend the $690.00 on the Miu Miu ones.... loved them. Both are so cute; definitely the Forever 21 for its price! I lov Miu Miu so much...have to splurge this time! I so want the Forever 21 wedges! Now! Such beautiful shoes. Love that thrifty price too. I'd spring for the saucy Sabrinas, wear them with a pair of bell bottoms and be quite content. Am going to have to splurge on this one, darling! I love the Miu Miu ones.......fabulous! I want those Miu Mius! I am huge fan of wedges! Divine choices, my dear! Ohh I can't believe those are from Forever! I've been looking for a brown pair. I loove the Miu Miu's! They are really cute and would look lovely with some flare jeans! Definitely Forever 21's with that price difference! I am so excited we have a F21 in Monterey now!!! I am headed over today to pick up a few of your finds. I love the F21 wedges. The color is just better. Have a good Sunday, E.
Oh tough one! :) I'm going to vote for the Miu Miu ones and hope they go on sale! I prefer the color along with the other details. You made it hard to choose this time around! Miu Miu! F 21 just looks like normal pair of strappy wedge sandals (and I hear F 21 shoe quality is horrible! ), but the Miu Miu's are unique with the extended straps, and the detailing on the wedge. I wish I could get my hands on the Miu Miu's! I like the dark color of the Forever 21 shoes as well. Great find! this is one where i might need to go expensive, I like that color brown more! miu miu all the way! i think these look pretty different--or different enough. 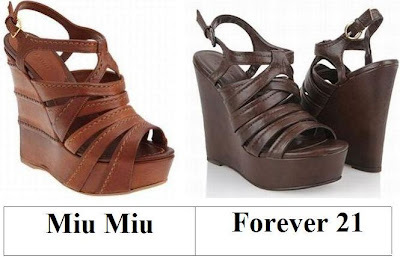 i'd go with the miu miu version for sure. woww identical but i'm really loving the miu miu's! They are both really pretty. I definitely prefer the colour of the Forever 21 ones though. But the wedge on the Miu Miu ones is incredible. Sigh. I used to wear those in hs! Ooooh, the Miu Miu pair might be pricey, but they're too amazing to pass up! I agree, Rachel! Those Miu Mius are adorable. Perfect for early spring nights! I agree with you, Rachel! Perfect for early spring nights with a light , flowing, long dress! LOVE these wedges! Go check out http://www.fashion-ade.com/ to find some just like this! Once you find them add them to your virtual closet! Price wise, I'm not paying for the Miu Miu's. Overall, though, I love the detail and color more on them. I love both shoes, but Forever 21 has the price! Oh those Miu Mius are covetable!